In case you are shopping for a kayak, you know the problems that come with getting a kayak of good quality. Even though kayaking is rising in popularity as a recreational sport, the problem lies in choosing the best kayak for your case. Based on the many vibe sea ghost 130 review, it is easy to tell why they are so popular. 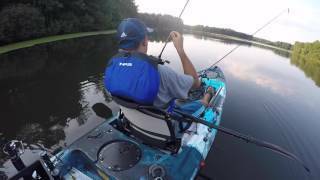 Here is a quick recap on what we think of this kayak. Some kayaks have designs that are suitable for flat lake surfaces, while others are very good in rough conditions. Not every kayak is equal, and making a decision on the correct choice takes a lot of research and effort. What makes Vibe Sea Ghost 130 kayak unique? The Sea Ghost 130 kayak is among the outstanding ones, with it being of high quality. They have the endorsement of various people, including sports enthusiasts and anglers. In addition, many recreational paddlers, surfers and scuba divers recommend them to other users, and that leads to their current popularity and their status as among the leading kayaks around the world. Founded by partners John Ewald and Joshua Thomas in 2013, they both had experience with both freshwater and saltwater kayaking, leading to the formation of the Vibe Kayaks Company. An interesting aspect is that the manufacturer not only focuses on kayaks, but also on varieties of fishing boats. Fishing kayaks are an underrated part of the fishing community, and the company gives sufficient attention to this aspect. They also have other boats such as the Sea Ghost 110, Vibe Yellowfin 100 kayak, and the Vibe Kayaks Skipjack 90. 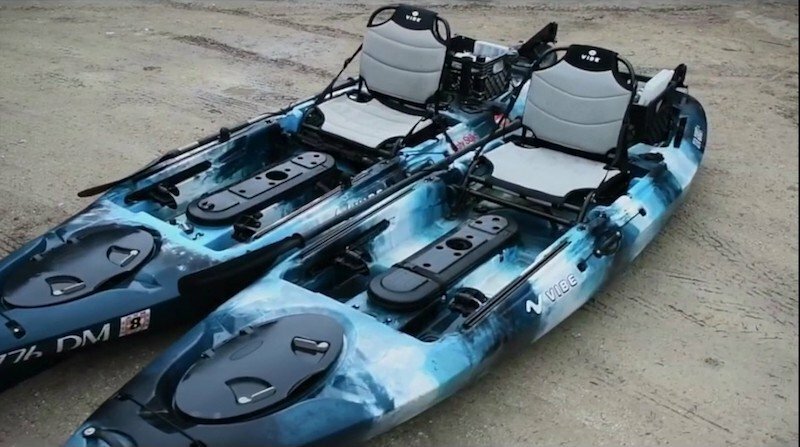 This model is among the latest models of the Vibe Kayaks line (in itself a newcomer to the scene), having a 2016 release. With its measurements of 13 feet in length, it can harbor a maximum capacity of 550 pounds, and has a width of 33 inches and weighs 74 pounds. 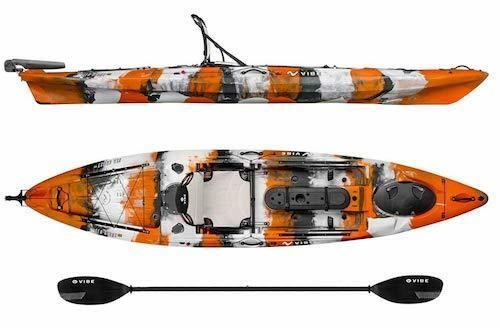 If you are searching for a kayak that promises you adventure as you carry out your fishing expeditions or related activities, this is the kayak for your needs. The package comes with a rubber and paddle, and contains several features that help in your endeavors. We will examine these in detail in this article. Demanding anglers tend to request similar features such as foot control rudder systems, extra rod holders, rear and front hatches that are easy to reach, large rear tank wells, center console with a lid that holds extra storage for fishing gear, tackle tray holders, and so much more. Well, the Vibe Sea Ghost 130 carries all these features, and these make it well suited for various anglers regardless of experience or favorite fishing location. Thanks to the wide hull, which is even wider than most boats, this gives the Sea Ghost 130 high stability levels regardless of water conditions and surfaces such as surf or rivers, and assists in enhancing comfort due to the wide room. In addition, that means that you have more space to store your fishing equipment as well as gear to allow for greater catches and an even greater experience. This unit also contains features that are useful to anglers, even the most demanding ones. 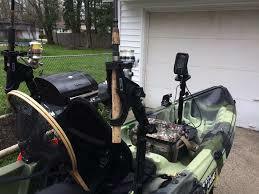 With its rear tank that is behind the seat, you can store fish in there. If you want extra convenience, look to the rod holders on the boat (there are plenty) and store your paddle there for paddle-free fishing time. Among the most notorious complaints in kayaks for users is the poor seating conditions and lack of comfort - may be due to the small room that most kayaks have. However, Sea Ghost 130 has a hero seat that gives you comfort, ensuring your fishing expeditions remain at ease even if you spend long hours or days on the water. In fact, the Hero seat in addition to the dual position adjustability give you room to go through challenging environments. 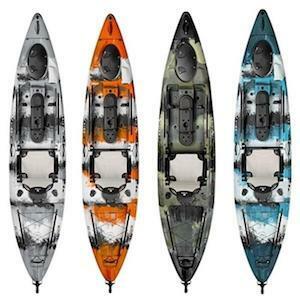 This is due to the increasing stability, as well as speed, and this kayak offers the best of both. In addition, the kayak contains a pre-installed rudder system that you control using your toes. This guarantees energy saving, especially in the events of windy days, strong currents and long paddles. According to a user, it takes some time to adjust to the system and get it right, but the good news is that it allows you to use the foot pegs without sliding the rudder. This can work as a good thing if you suffer from hip issues because of using slide rudders. The paddling of this kayak is easy, and it responds very well. In windy conditions, it may become slower, but that is understandable especially when wind currents are strong. The boat itself maintains its motion and course when you stop paddling, while the glide is nice. In the case of whitecaps, the kayak handles them very well when it moves parallel to them, since they hit the starboard side. It also sheds incoming water quickly via its scuppers, and you do not feel uncomfortably wet even in wet conditions. The rear and front hatches are very useful in storing gear, as well as rigging. Among the needs that you may require for under deck access, adding tracks is the most prominent, though you can use screws or rigging bullets. However, the unit has rear and front track on both sides, so it sorts you out on that department. In addition, they are good for other purposes such as gear storage during camping trips that you may make overnight. The center console is even more impressive, thanks to it containing features such as storage, tackle holders and the allowance for mounting equipment like depth gauges and fish finders, in addition to other equipment if you wish. Some accessories include a transducer port that acts as a fish finder, and it comes with a protective lid and mounting points. This remains a good feature aiding in navigation and locating dense fish areas. 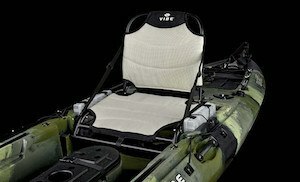 It also comes with a limited lifetime warranty for the kayak itself, and one year on the parts that attach to the kayak. 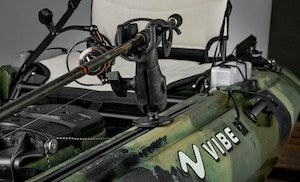 Editor's Note: With all these features, you would probably think that the Vibe Sea Ghost is high-end in terms of price. You will be shocked once you see its price. This is surely a favourable deal especially for first-time angler. Wide hull that provides greater levels of stability. 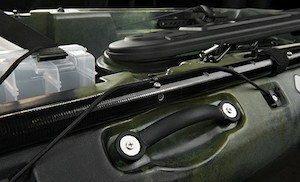 The rear tank is large enough to give you storage options when you are fishing. The foot rudder system provides plenty of control over your fishing vessel. The front and rear hatches are easy to reach, allowing for easy and fast access to your fishing equipment. 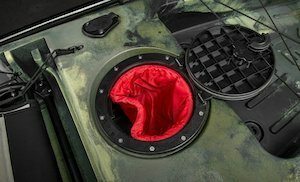 Contains a center console that allows for greater options of storage when you are out on the water. Able to support large weight capacity. The center console can sometimes get in the way of standing. Can be quite heavy for smaller people. The hatch holds in humidity when you store cold drinks due to lack of aeration. The overall verdict on this marvellous kayak is that it is a worthwhile purchase, earning a rating of 4.5/5. We also went through a series of vibe sea ghost 130 review and all of it earns positive remarks and feedbacks. 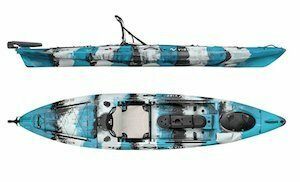 Since it contains features that even the most demanding angler wants, it does a good job at being a comfortable kayak at an affordable price. In addition, what adds to its advantage is the fish finder and tracking capability, which is a feature that many kayaks lack.